"As is the desire, so is our will. As is the will, so is our deed. As is the deed, so is our destiny. " 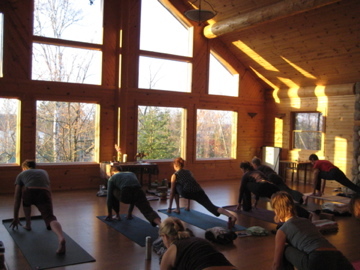 Our annual Fall Immersion is intended for yogis looking for deeper study and practice of yoga in a retreat setting. We will explore the in-depth teachings and practices of through dharma, meditation, asana, pranayama, mantra, kriya, chanting, yoga nidra and self-inquiry. Awakening the 3rd Eye Center: Establishing sthithi- the power of inner peace foundational to Yoga. Awakening the Navel Center: Tending the sacred fire of empowerment and self-transformation, to overcome fear, attachment and limiting self-identity. Early Reg. Discount- $25 off above rates when you register + pay in full by July 31 Yoga Studies Grads- $25 off above rates or $50 when combined with Early Reg. Massage will be available during breaks. Please note meals are not provided. Each cabin has a fully equipped kitchen for all your cooking needs. We will share evening meals if the group size accommodates eating/cooking together. For more information on the accommodations, visit the fall retreat page. We will plan to eat dinners communally, with groups taking turns preparing food. To reserve your space: please send your Fall Immersion Registration + Waiver and $150 deposit per-person (non-refundable). We accept cash, check, Credit Card, and electronic payments (paypal, venmo, square cash). All payments are due by Sept 15. All payments are final. There will be a $35 fee for payments, payment plans and registrations received after Sept 15. Other discounts and scholarships are not available. For those unable to pay-in-full before Sept 15, payment plans are available through paypal credit. Please email ben@vincentyoga.com for CC or electronic payment. There is a 3.5% service fee to cover Credit Card transaction costs. The day will consist of morning + afternoon yoga, a guided Yoga Nidra, self-inquiry practices, conversation on vitality + self care & a lunch break. Spring is a time of rejuvenation and rebirth. From the emergence of tulips, to cleaning out the home and gardens to the holidays of Easter and the Spring Equinox, everything is casting off the remnants of the past to be born anew. In the traditions of Yoga and Ayurveda, it is considered one of the best times to purify and cleanse the body, mind and heart. Join Ben + Angela for a special cleanse this May at One Yoga. 2 workshops consisting of a lecture, postures, breath-work, guided meditation and relaxation. Unlimited drop-in classes with Ben + Angela. Virtual support through readings, video and audio files for cleansing the body, mind and heart. Structured guidance around diet, lifestyle and purification practices. Give yourself the gift of clarity, vitality and a renewed sense of well-being this Spring! If an event is canceled, you will be notified by email and will receive a full refund. The ancient seers of yoga foretold of a coming age known as the Kali Yuga. This “age of transformation” would be ushered in by dark times in which materialism, narcissism and fundamentalism would eclipse the clear seeing of our place and purpose in the greater order of the cosmos. Fear, anger and suffering would pervade human consciousness – caused by continuing to live under the illusion of ourselves as separate from one another and the earth. As with any transformation, there is simultaneous death and birth, destruction and creativity. There is both potential for greater pain or true healing. These times make the work of inner work of yoga even more important. For transforming the fear, anger and suffering within us, and moving into the world from a place of clarity, purpose, compassion and love. This balance between living in alignment with truth in the inner and outer world is known as Dharma. From the Bhagavad Gita to Mahatma Gandhi, the yoga tradition has guided us on the path of living dharmic-ly through time of change and adversity. In this special Five Day immersion, we will dive into traditional teachings and practices to awaken our power and light in the Kali Yuga. This immersion is for those feeling called to to live a more meaningful and connected life, and to make a positive impact on our world. The immersion will be held in Leucadia, California. Located about 30 min. north of downtown San Diego, this area has been an epicenter of Yoga in the US ever since Paramahansa Yogananda founded the Self Realization Fellowship in the 1920’s. Leucadia has retained its small beach town vibe amidst the rapid growth of Southern California. Lodging is available at the Surf House Leucadia, located on Highway 1 just a few blocks walk to the yoga immersion and the beach, as well as restaurants and coffee shops. You can also find plenty of options though airbnb or verb. You’ll have mornings and evenings to enjoy the beauty of the Pacific Ocean in Southern California. This small group immersion will be limited to 22 people, in order of reservations received. To reserve your space, contact ben@vincentyoga.com and submit your $250 deposit (non-refundable). Empower will (icca), knowledge (jnana) and action (kriya) shakti. The timeless teachings and practices of yogic meditation are as relevant today as ever. Amidst the busy-ness, stress and turbulence of our modern lives, the postures, breath work and relaxation of Hatha Yoga have become very popular. However, without meditation it is an incomplete science. Meditation allows us to experience our unchanging essence, true nature or Soul. Communion with unchanging allows us to live skillfully and gracefully in a world of change. This retreat is a special opportunity to immerse yourself in the art and science of Yogic Meditation. Each day will have extended periods of teachings and practice (guided and self-guided), periods of silence, and evening sat-sangs to receive guidance. In depth teachings on the process of yogic meditation: asana (meditation posture), diaphragmatic breathing, pranayama, and cultivating concentration, meditative awareness and absorption. The Place: Camp du Nord, near Ely, MN. Du Nord is nestled amongst the pine and birch forest alongside Lake Burnside, a stones throw from the Boundary Waters. Camp du Nord has been a natural place of retreat, relaxation and reflection for more than 50 years. The Yoga: The immersion sessions will feature extended hours of teaching and practice each day. Sessions will focus on yogic mediation, and may include dharma talks (teachings), asana, breath work, meditation, chanting, journaling, and self-inquiry. Please see the schedule below. Retreat Schedule Thursday 2/1 – 5 – 7:30pm Friday 2/2 – 8:30- 11:30 am + 3-6pm, Saturday 2/3 – 8:30- 11:30 am + 3-6pm Sunday 2/4 – 8:30- 11:30 am + 3-6pm Monday 2/5 – 8:30-10:30 am 6-7 am each morning will be chanting and unguided meditation. 8-9pm each evening will be satsangs: meditation, chanting, and Q + A. We will be observing noble silence daily before 11:30 am and after 8 pm. The retreat will begin Feb 1 at 5 pm. We will depart after cleanup on Monday Feb 5th in the early afternoon. We encourage carpooling, and will assist in arranging transportation. For Directions, click here. Due to the immersive nature of this work, this will be a small group retreat. Space is limited and we anticipate the retreat will fill up. If you are planning to attend, please send registration and deposit as soon as possible to reserve your space. Thanks! Three nights lodging in shared or private rooms. Private rooms feature queen beds, preference for private rooms will be given to couples. Use of saunas, cross country ski and snowshoe trails. Skis + Snowshoes are available to rent thru Camp du Nord. Meals are not included in the price of the retreat. Each cabin has a full kitchen for your culinary needs. We will arrange evening meals to share as a group, each person will be part of a team who cooks one night. All the fun you can have, with new and old friends! Private Cabins may be arranged for an additional fee, with payment in full. Rates will depend upon the number of occupants. Early bird discounts are available to those who register and pay in full by Dec. 24, 2017. All payments are due in full January 15, with a fee of $35 for late payments, payment plans & registrations received thereafter. All payments are final as of Dec. 31. There will be no refunds due to inclement weather, travel or sickness. To reserve your space, please send your Winter Retreat Registration + Waiver and $150 deposit per-person (non-refundable) You can can also pay by Credit Card over the phone. There is an additional 3.5% charge for cc purchases to cover service fees. Massage will be available during breaks. Please note meals are not provided. Each cabin has a fully equipped kitchen for all your cooking needs. We will plan to eat dinners communally, with groups taking turns preparing food if the group size accommodates eating/cooking together. For more information on the accommodations, visit the fall retreat page. All payments are due in full September 15, with a fee of $35 for late payments, payment plans & registrations received thereafter.